The sci-fi bug has bitten me and I am in possession of a book about the Mothman. What it is is a scary looking thing with glowing red eyes that haunted residents in West Virginia way back in 1966. I couldn't understand it when the radio show Coast to coast on KFI, a few weeks ago, had on an expert Mothman researcher. I mean, who cares? To me, the Mothman is like Yeti, Bigfoot, and Lochness monster. I simply don't believe it. The reasons I am so intrigued about it is best explained if I upload a copy of a newspaper clipping. Meanwhile, I shall describe an oddity that most Mothman fans may or may not have overlooked. For those conspiracy minded folk brave enough to delve into my discovery, I'm getting all my supporting information from Mothman: the facts behind the legend which should link to isbn 2001119432 (if typed into your browser's location field). These are authentic newspaper clippings collected by Linda Scarberry. She had saved them over the years to chronicle the events of the Mothman phenomenon and the happenings around Point Pleasant, West Virginia, and surrounding areas. The Gallipolis Daily Tribune, Gallipolis, Ohio. All clippings are reprinted by permission. This book, BTW, was first published in 2002. Also, would somebody please notice the peculiar digits in the ISBN LCCN number 2001119432? Is it me? or do those numbers remind you of a date: 2001-11-sep. Page 68 is entirely devoted to a newspaper plate, as most pages following 68 until page 125 also contain pictures of newsclippings. The first plate of the newspaper clippings, however, contains a several captions. The first caption is the credit line noting that the clipping is reprinted by permission and originally published by The Point Pleasant Register, and the second caption explains that it is the article which broke the story. 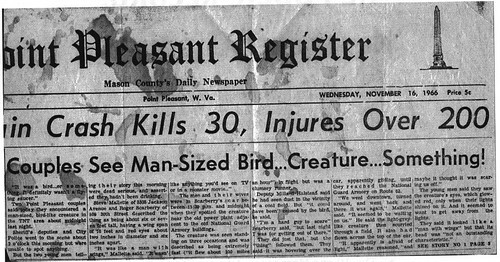 and the separate heading to the Mothman article reads: Couples See Man–sized Bird… Creature… Something! It's the headline story that I find shockingly unbelievable. When I search the Internet, I cannot find any reference to a major crash having taken place on or before November 16, 1966, which resulted in the casualties described in the headline. It's mysterious because many other news reports of lesser damage are in abundance on-line. Not this one. Very odd. The first word is clipped as it ran out of the range for which the initial clipping was made, but part of the letter that precedes the "i" in the word 'in' can be either a letter "a", or a letter "u" according to the font style consistency of the headline. If the incomplete word ends in a-i-n, then it's very likely that that word is train or plain, something I think would be easily tracked in a keyword search with today's search engines and newspaper archives; and if the incomplete word ends in u-i-n, then it's possible the word might be ruin. There's so many possibilites, but I'm duped over why I cannot find reference anywhere on-line that describes the catastrophic event of injuries and fatalities. This entry will definitely earn it's own tag for future developments!